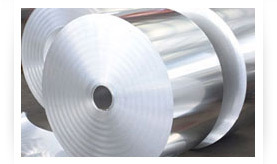 Aluminum Sheet & Coil is a rolled product (either hot rolled or cold rolled) produced into a certain gauge thickness from sections of aluminum billet and cut into sheet or stripped coils. 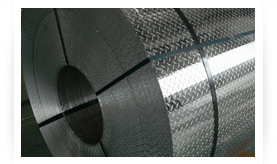 Cold rolling is most often used to decrease the thickness of plate and sheet metal. Hot rolling is primarily concerned with manipulating material shape and geometry rather than mechanical properties. Applications may include street and building signs, gutters, patio decks, metal roofing solutions, entry systems, the uses are almost limitless! Commercially pure aluminum, highly resistant to chemical attack and weathering. Excellent for chemical processing equipment and other uses where product purity is important. Easily worked and welded, ductile enough for deep draws, but the lowest strength aluminum alloy. Stronger than 1100 with same good formability and low cost. Fine corrosion resistance and weldability. Used in stampings, spun and drawn parts, mail boxes, cabinets, tanks, fan blades. Main alloy is magnesium. Far stronger than any of the alloys described above, yet forms well with reasonable inside bend radii. Corrosion resistance and weldability is very good. Better salt water corrosion resistance than 1100. Used for electronic chassis, tanks, pressure vessels and any number of parts requiring considerable strength and formability at reasonable cost. 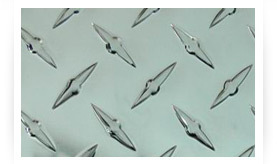 Aluminum is specified with a 4 digit alloy followed by a temper designation. 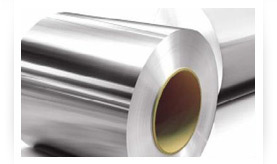 For example, 5052-H32 indicates an aluminum/magnesium alloy that has been strain hardened and stabilized by low temperature heating and is 1/4 hard. 0 Annealed, re-crystallized (wrought products only). 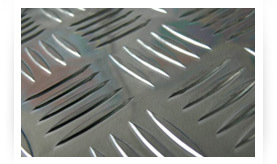 Applies to wrought alloys which are annealed to obtain the softest temper, and to cast alloys which are annealed to improve ductility and dimensional stability. H Strain hardened (cold worked) with or without thermal treatment. H1 Strain hardened without thermal treatment. H2 Strain hardened and partially annealed. H3 Strain hardened and stabilized by low temperature heating. Alloys that are precipitation hardened gain their strength by solution heat treating (SHT) and ageing. 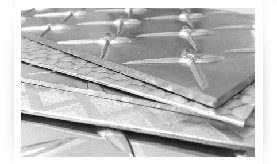 T Thermally treated to produce stable tempers other than F, O or H. Applies to products which are thermally treated, with or without additional strain-hardening, to produce stable tempers. T1 Naturally aged to a substantially stable condition. Applies to alloys which are not cold worked after cooling from a high temperature shaping process, or in which the effect of cold working in flattening or straightening may not be significant in mechanical property limits. T2 Annealed (cast products only). Applies to alloys which are cold worked to improve strength after cooling from an elevated temperature shaping process, or in which the effect of cold work in flattening or straightening is significant in mechanical property limits. T3 Solution heat-treated and then cold worked. Applies to alloys which are cold worked to improve strength after solution heat treatment, or in which the effect of cold work in flattening or straightening is significant in mechanical property limits.